This production opened on April 27, 2018 and closed on May 6, 2018. 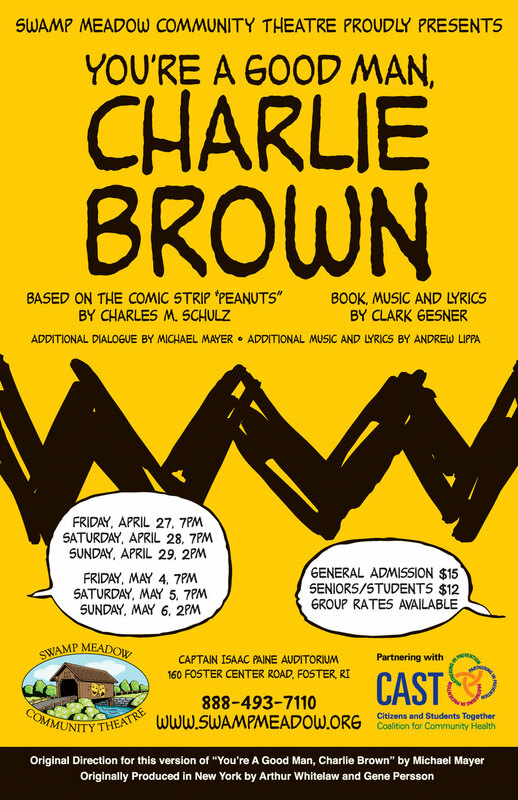 Charles Schulz’s beloved comic comes to life in Clark Gesner’s classic musical. You will think you have become part of the “gang”. Lucy will boss you around, Linus will share his wisdom while clutching his blanket. Sally will make sure you know the way things should be. Schroeder will entertain you. Snoopy will be awaiting “Suppertime”. And the “Blockhead”, Charlie Brown, is his charmingly failing self. You will laugh, cry, and sing along as you learn to affirm yourself with all your foibles and endearing qualities. Guaranteed to please audiences of all ages! Performances are April 27, 28, 29 & May 4, 5, 6 2018. Check this page for the latest information.